$75.00 In stock - low quantity. Order in the next 11 hours, 44 minutes and it will go out today! What do you get when you update the classic Hippity-Hop Rabbits to the 21st century? Hippity-Hop Aliens! 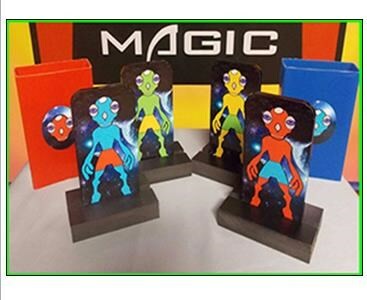 Standing at nearly 11" tall, you show two aliens, red and blue, and the identical spaceships in which they arrived to earth. When you put them inside the ships, and they magically "teleport" to each other's ships, your audience will shout out loud how they think it works. And that's just the beginning! Because, at the end of the trick, everyone will be surprised when the red and blue aliens change to yellow and green! updated to the 21st century, this sucker effect creates many moments for young audiences to shout out "how it works" as you pretend to misunderstand their requests. The genius behind Hippity-Hop Aliens is that this prop makes sense. Aliens, unlike rabbits, come in all colors, so when they change into yellow and green, there is a logic behind the transformation that doesn't exist when using images of rabbits. Get this new twist on the classic Hippity Hop Rabbit Trick and take your magic into outer space!